Haven’t decided on a hotel yet? 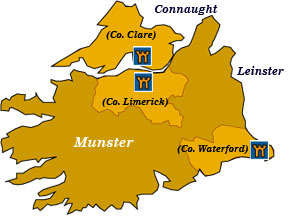 You can look at other available hotels in the Munster region with Booking.com. Dramatic coastal scenery, wild terrain, glassy lakes, and rolling farmland make traveling in this region of Ireland an utter delight. Lines of tour buses have much the same idea, but turning off the highway and heading down any narrow road will reward the adventurous. The area around the River Shannon, which cuts between Counties Clare and Limerick, has attracted settlers since the Stone Age. For 700 years, the Rock of Cashel in County Tipperary was the seat of the kings of Munster. Castles dotting the landscape give testimony to the Anglo-Norman invasions. Allow plenty of time to explore the region. Make one of the charming small towns a base, and spend at least one day hiking, cycling, fishing, or even catching a live music performance. Cliffs of Moher If breathtaking, natural sites appeal to you, the 8 km long (5 miles), 200 m (650 ft.) high sheer limestone rock face rising above a crashing sea cannot be beat. Views from the edge are terrific. The Burren This extended limestone plateau hosts rare varieties of arctic and Mediterranean flora that coexist together. Birds and butterflies abound. Dotting the landscape are prehistoric sites (one of the oldest is over 5000 years old), stone forts, and castles. Dysert O’Dea Castle and Archaeology Centre Sometimes castles are transformed into other uses besides fabulous accommodations. This one houses the Clare Archaeological Centre, which features a history trail that winds past some two dozen ancient monuments in the area. Knappogue Castle For over 1000 years the McNamaras ruled over this area of Ireland. They built this particular castle in 1467, while Cromwell commandeered it as a base in the 17th century, sparing its destruction. Today, you can visit the castle and even enjoy a medieval banquet held nightly during the summer, or rent out part of the castle on a self-catering basis. Bunratty Castle & Folk Park This 15th-century castle, famed for its beautiful restoration work and medieval banquets, is a major attraction in western Ireland . The adjacent folk park recreates Irish rural life at the end of the 19th century. Limerick Highlighting this straightforward Irish city is King John’s Castle, a Norman castle of massive curtain walls and five towers built between 1200-1212 with great exhibits documenting the castle’s history. Limerick’s Hunt Museum presents a stellar collection of prehistoric and medieval art pieces. Village of Adare is considered one of the prettiest villages in Ireland with its thatched cottages, ivy-covered medieval churches, Tudor-style buildings, and surrounding woodland. Waterford Founded by the Vikings in 914, Waterford holds the honor of Ireland’s oldest city. Its city walls are well preserved, and the 18th-century Georgian buildings of the city center shine again. Take an interactive tour of Waterford’s 1000-year-old history at the Waterford Museum of Treasures. Most visitors head over to the famous Waterford Glass Factory where tours explain the process of making crystal. Naturally, a sparkling showroom offers temptations galore. Lismore is a charming little village dominated by the grand Lismore Castle, Irish seat of the duke and duchess of Devonshire. Only the castle grounds may be visited, but if you have a princely sum in your pocket, you may rent out the entire castle—complete with the duke and duchess’s staff. The Lismore Heritage Centre presents an excellent introduction to the surrounding area. Ring of Kerry (County Kerry) So famous the tourist buses seem to reach end to end like elephants at the circus, the Ring of Kerry offers gorgeous heather-clad mountains and seaside charm. To the east, Killarney National Park and the Lakes of Killarney is a wonderful place to hike, cycle, and enjoy the outdoors. The 15th-century Ross Castle was the last Irish castle to fall to Cromwell’s forces. An Daingean (Dingle) Peninsula (County Kerry) A drive around the peninsula reveals some of Ireland’s most spectacular scenery. High mountains, deeply forested hillsides, coastal cliffs that plunge into a misty sea, and a wealth of prehistoric sites and charming villages are open for exploration. Skellig Michael (County Kerry) A pinnacle of jagged rock rising straight out of the ocean, Skellig Michael hosted one of the world’s most remote monastic communities from the 6th to 12th centuries. 600 steps lead to the stone structures, now a UNESCO World Heritage Site. Rock of Cashel (County Tipperary) The magnificent Rock of Cashel is actually a medieval complex, which rises from the plain of Tipperary. Originally, the 5th-century seat of the Kings of Munster, in 1101 the Church acquired the property and turned it into a religious center until Cromwell massacred its occupants. The cathedral, Romanesque Cormac’s chapel, and the tower may all be explored. Cahir Castle (County Tipperary) The Butler family ruled over Cahir from the time of the Anglo-Norman invasion until 1964. One of the most imposing castles in Ireland, its outstanding keep and defensive structure is remarkably preserved. Nearby, the 19th-century Swiss Cottage was built by the Butlers as a romantic folly and is well worth a detour.